Last week, a dozen members of the Reserve Police Officer Academy graduated in a ceremony held on the campus of Mid-America Christian University in south Oklahoma City. Four of MACU’s own reserve officers graduated from the academy on October 21, in addition to eight officers from various departments across central Oklahoma. 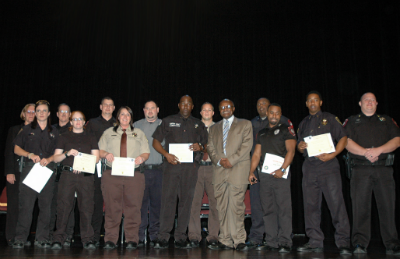 The graduation ceremony marked the completion of seven months of evening training sessions held on university grounds under the coordination of MACU Assistant Police Chief Mark LaHue. State law requires the certification—conducted by the Council on Law Enforcement Education and Training (CLEET)—for all peace officers, both public and private. The mission of CLEET is to enhance public safety by providing education and training which promotes professionalism and enhances competency within the ranks of Oklahoma law enforcement; manage and regulate the licensing and training of private security. “The training we receive as officers is invaluable,” said Chris Hampton, who served as class leader. “When the tests have been taken, certificates have been issued and instructors have gone home, the training will be the most important thing we take with us.” Hampton said the training will undoubtedly assist in the officers’ duties to serve communities and protect individuals in need. Although a date has not been set, Pool said MACU plans to host more training academies in the future. This entry was posted in All Church of God, Colleges & Universities and tagged academy, CLEET, law enforcement, MACU, Mid-America Christian University, Oklahoma City, police, reserve, training. Bookmark the permalink.